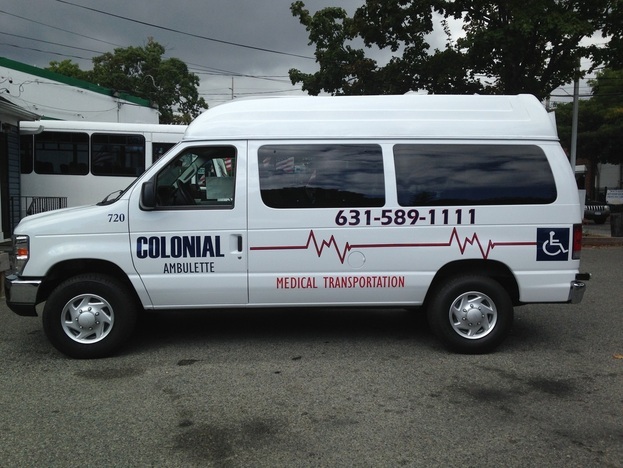 Colonial Transportation provides non-emergency New York medical transportation and ambulette services for seniors and people with disabilities in New York and beyond. We specialize in disability transport service throughout the greater New York area and are dedicated to providing reliable, professional, and caring ambulette and para-transportation services for people with special needs including seniors and disabled citizens. We provide local and long distance New York ambulette transportation 24 hours a day, 7 days a week, to doctors' offices, airports, train stations, hospitals, holiday visits, family occasions, stadiums, theaters, restaurants, hotels, excursions and more. Ambulette drivers are courteous professionals that are thoroughly trained. Drivers are commercially licensed and tested annually by State DMV. All disability and seniors transport vehicles feature high tops with hydraulic lifts, tinted windows, recessed lighting, dual climate control, and six point safety harness belts. New, top-of-the-line ambulette vans can accommodate any type of travel requirements: wheelchairs, extra wide, motorized. A caregiver, personal care attendant or family member can also accompany you on your ambulette trip. In fact, they can accommodate up to 5 family members/companions! Although it is best to arrange your senior or disability transport needs early, We are standing by 24-hours a day, 7 days a week, including public holidays to reserve, schedule, and confirm your travel plans. Give us a call at 631-589-1111 to learn more or schedule service.